Spyder and Black SL lined up - but we didn't race each other. Cool graphics on this SL with some mods. Test and Tune night. Turnout was huge, with hundreds of cars and motorcycles. I saw 2 VR4s (Lorne had one of them), one Stealth TT, 2SLs, Armitage's VR4 Galant and I had my spyder. Lorne saw a couple of others I didn't. 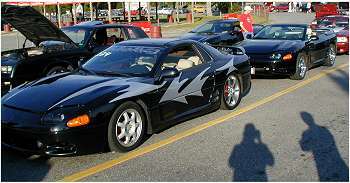 Other cool cars included a viper, Cobra, Hemi Cuda, a couple of 13 second Lightning Pick up trucks, and tons of others. Track is about sea level and weather was dry and in the low 70's. This was my first time both seeing and racing in a drag race. My best was a 14.387 at 97.33 mph. My first race ever. Not a bad RT, but I slipped the clutch too much. The Golf I raced looked like a beater, but ran surprisingly well. Terrible RT - could have gotten a Big Mac at a drive through quicker than this. I also had my 200 pound brother in the car. But I still smoked the Stang, and he wasn't too happy about it. You can see how he beat me to 60ft (which proves what a crappy launch I had) and I had already pulled him in at the 1/8. Glad to waste this guy, but not a pretty run for a VR4. This was turning out to be a hell of a race until I missed third gear. I couldn't believe this Mercedes was so close to me up until that point. I talked to the guy later - his car has 326 hp stock and he added an intake. Still a pretty weak launch for me - I bogged it. This was my best overall time and I was very happy with the RT. 0-60 ft was still weak, I wasn't revving high enough. The MR2 was modded. I could clearly hear his BOV even when he was behind me. He had a better time but with my RT I beat him down the track, which was a real thrill since I felt like it had been a pretty good race. Overall, I had a great time and this was an excellent experience. I have so much more respect now for some of the times I've seen guys posting and the amount of work and practice it takes. I had no idea that getting a good RT and launch would be so difficult. Lorne and the other VR4, plus the stealth RT were all in the low 13s. I believe all had extra boost, intake and exhaust. Those few mods take a lot of time off. I was impressed with the fact that even with my massive lack of experience the spyder pulled better times than the vast majority of cars, most of which were modded to some extent. Gives me even more respect for these VR4s. We beat up on tons of big V8 modded camaros, mustangs, etc. Only a handful of cars were in the 12s and I think I might have seen 1 car in the 11s. I never realized how hard it is to get times down there.